Back in January, the Trump administration launched an aggressive effort to convince the Venezuelan military that if it did not topple President Nicolas Maduro, it would be destroyed by sanctions and, perhaps, a US invasion. The rhetoric succeeded in alarming American leftists, who loudly denounced the coming coup, and Russia, which dispatched two planeloads of military advisers and equipment to stiffen the regime’s defences. To date, however, the campaign has had virtually no effect on its intended target. There have been no significant defections of Venezuelan generals, and no sign of any move against Maduro, who has remained entrenched in the presidential palace even as opposition demonstrations have sputtered. The drive to replace Maduro with National Assembly leader Juan Guaido, which has been the Trump administration’s most robust foreign policy initiative after the attempt to disarm North Korea, has stalled. The problem here is not the Russians and their mostly for-show intervention. More important is the corruption of senior military leaders and the malign influence of the thousands of Cuban advisers embedded in the chain of command. The most salient factor, however, may be that, unlike Bernie Sanders and other self-styled resisters of US imperialism, the Venezuelans know that Trump is bluffing. There is no credible US military option in Venezuela, and very little chance that Trump would actually try one. The result is that the administration lacks a sure-fire means to bring about the regime change upon which it has staked considerable political capital and prestige. It has to hope that sanctions, diplomatic pressure and, above all, a horrendous and steadily worsening humanitarian crisis for the 30 million or so people remaining in Venezuela eventually force a change. Over the past several years, Maduro, an ignorant and charmless but tenacious ruler, has developed a survival strategy that is part rope-a-dope, part North Korea. He responds to popular demonstrations and strikes by dispatching gangs of paramilitary thugs and other special forces to beat or shoot protesters in poor neighbourhoods. He arrests and tortures any military officer suspected of disloyalty. Most of all, he stands by as Venezuelans suffer life-threatening shortages of food, water and electricity — including power outages that last for days. More than 3 million people have fled the country, and most of those who remain are focused on staying alive. Some, imbibing the regime’s relentless propaganda, blame the opposition or Washington for the empty stores and countrywide blackouts. One problem with the administration’s strategy is that those charges will start to sound more plausible in the coming months. Though the United States was not responsible for the collapse of Venezuela’s economy — that was a pure product of Hugo Chavez’s potted version of socialism — the sanctions it imposed on Venezuelan oil in late January could compound the humanitarian crisis. Oil exports — the country’s only significant source of hard currency — are plummeting. According to Russ Dallen of Caracas Capital, they fell from 1.15 million barrels a day in January to 650,000 barrels a day in the first half of March — or 43 per cent. If that continues, Venezuelan imports of food and medicine, already disastrously insufficient, will drop off a cliff. Maduro, who has refused most offers of humanitarian aid, finally agreed last week to allow Red Cross deliveries. But that will supply only 650,000 people, a fraction of those in need — and the material help he’s receiving from Russia is even more paltry. If famine begins to spread in what was once Latin America’s richest country — a distinct possibility — or millions more refugees pour into Colombia and Brazil, which is even more likely, the pressure on Trump to ease economic sanctions could mount. If it comes from the Latin American countries that until now have been US allies in the anti-Maduro campaign, it will be hard to resist. Trump, after all, launched his offensive only after the Latin-led Lima Group declared Maduro’s presidency illegitimate. The administration’s calculation is that the weight of Venezuelan suffering will crack the military before it does the anti-Maduro alliance. 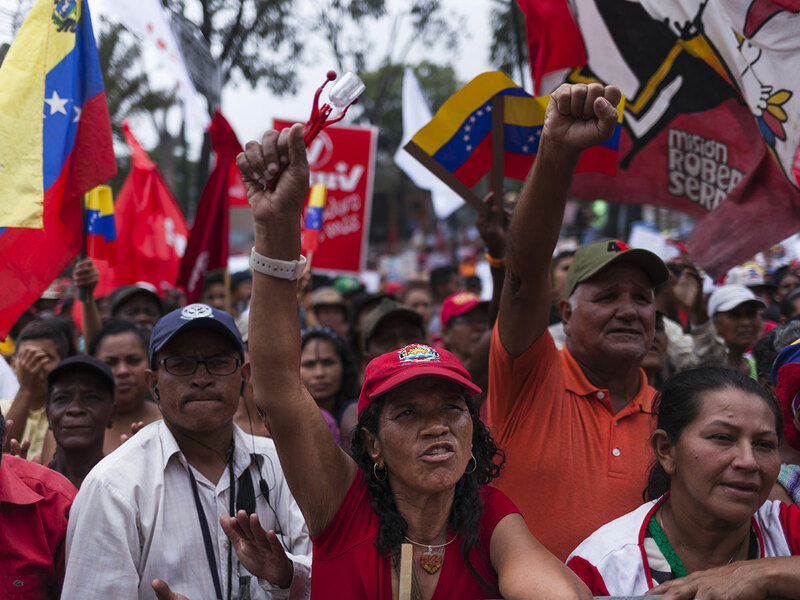 Along with the threats of invasion, conciliatory messages have been aimed at the generals, including a promise of amnesty and assurances that the Chavista movement will be free to compete in a restored democracy. In essence, what was meant to be a swift blitzkrieg against a crumbling dictatorship has turned into a war of attrition in which the primary weapon, for both sides, is human hardship. It’s easy to understand why some Venezuelans hope for a US Marines landing that puts a swift stop to it. But notwithstanding Trump’s bluffing, that’s not the way this crisis will end. Jackson Diehl is the deputy editorial page editor of the Washington Post.